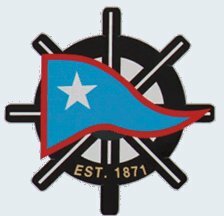 Detailed information on the WYC flags - burgee, club flag, and officers flags - can probably be found in the WYC's Constitution & By-Laws and maybe in the officers list. Unfortunately, for us, these are only accessible for members. 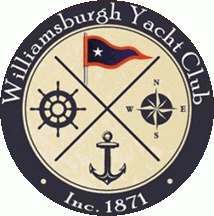 In their logo on Facebook, as well as on a physical sign, the Williamsburgh Yacht Club use a light blue for their burgee. On the website, http://williamsburghyachtclub.com, however, the burgee is shown with a darkest blue field and a ratio of approximately 4:5. I assume the star is supposed to be symmetrical, though, which in that image it is not, leading me to a burgee with a ratio of 5:7. A flag of the same design but longer can be seen in the emblem on the site. I assume this is the club flag, which can be seen hoisted on Opening Day on Facebook, though it's hard to determine the ratio there. I estimated 5:11. It must have been organised in the years before 1865, but the exact date is currently unknown. Then on 11 April 1865 the members decided on incorporation, but first on 5 April 1871 the club was formally incorporated. It's this last date the club consider their foundation, which means that now in 2014 they are in their 149th season. It would be interesting to know whether they used a jubilee burgee for their previous two jubilees, and whether they intend to do so now. The WYC have been quite active in competitive sailing over the years. The club have seen their share of changes of location as well as a number of natural disasters and fires. From a flag point of view, most interesting might be that they were "the 1939 World Fair’s flag yacht club". I wonder whether any special flags, like World Fair 1939 or 1940 burgees. were involved. Lately, the social activities have been more predominant, but the WYC are expanding their activities and hope to become more active in racing again in the future.